We took about 4 hours driving from Mekah to Medinah. Along the way, I told Tariq the story of Prophet Muhammad SAW's migration from Mekah to Medinah. I asked him to observe the landscape. The reddish black mountains, the extremely hot weather, the absence of trees and clouds..
Can you imagine Tariq, how Prophet and his BFF, Abu Bakr walked thru this desert to come to Medinah? Even though he was tired, he keeps on walking. They walk and walk and walk and walk for one whole month, 400 km..
Because Allah ask him to do so. Because the Quraish wanted to kill Prophet. Of course he was tired. But he did not give up. He stay focus. He puts in the effort. He rest only a bit then continue walking. Until he reached Medinah..
His wife has died at that time..
And Tariq 1001 questions continues..
City of Medinah holds so much history and lessons. 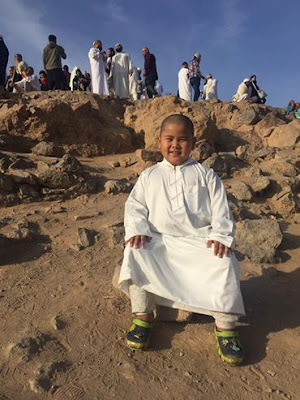 Tariq's picture here is on the Mountain of Uhud. We told him the story of the archers. 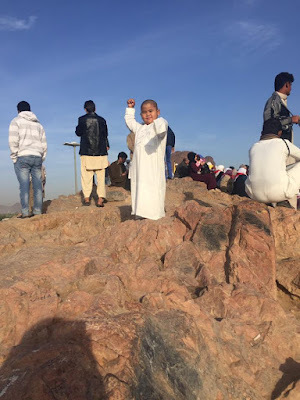 He was so fascinated and he finds it amazing that they can stand on this very uneven hill, full of pebbles and stones mountain and still can shot bullseye. So he decided to pose like the WingShun Master, and strike another pose as Katniss, the archer!